Fairly Green - Miessence: Fairly Green - Kale: How Good Is It? Fairly Green - Kale: How Good Is It? I am trying to get back on track with my health and eating habits. So far, so good. I actually have been walking/exercising more and eating healthier since my return from Australia. I decided to look into kale - it seems to be the new "hot" green to have. A year ago it was wheat grass and lately it's kale. I see kale everywhere - in everything from smoothies to pizza. I think kale tastes very bitter but I was willing to give it another shot after my niece made me a very nice and tasty kale salad. Why is kale so good for you? 1. 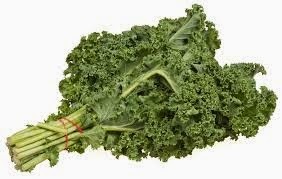 Kale is rich in calcium, lutein, beta-carotene and vitamins A, C and K.
2. It is only 33 calories per one-cup serving. 3. It is a strong anti-inflammatory food and it's filled with omega-3 fatty acids. We know that omega-3 is helpful for arthritis, asthma and autoimmune disorders. I've got arthritis in my index finger and my neck which requires some attention. Sheeesh. 4. Kale helps to keep your estrogen in balance. This is very important for women who are concerned about breast cancer and for those with estrogen-dominant illnesses like fibroids, fibrocystic breast disease or endometriosis. Eating kale is a natural way to help combat these diseases. Is there anything bad with kale - can you overdo your kale intake, I wondered? The answer surprisingly, is YES. Raw kale is high in Vitamin K and should be eaten very sparingly if you are on blood thinners (and maybe not at all). The deep green of kale means that this cruciferous vegetable contains something called oxalates, which some testing has found to promote kidney stones. And worse news - high intake of kale has also been linked to hypothyroidism. My husband can't eat kale but it would be a good addition to my diet. 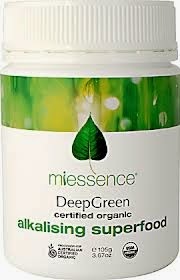 My alternative go to food is still Miessence Deep Green, of course, which contains freeze dried kale, plus 6 other super cleansing alkalizing green foods and vegan source of vitamin B12. I stir it into a 1/4 cup juice, chug it down and I am good to go. It's a good and easy source for all my mineral needs. So don't have a kale smoothie every day (which does seem to be a trend among some celebrities) and slowly introduce it into your diet. Like any food, variety and moderation is best. 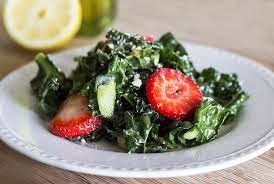 A trick to making kale less bitter, is to roll the crunchy leaves, cut out the fat vein in the leaf, chop and toss with a little lemon. Add tomato and balsamic dressing and it's pretty tasty. Happy health to you.